Our alpaca yarns from the 2014 shearing of our alpacas have just arrived!! 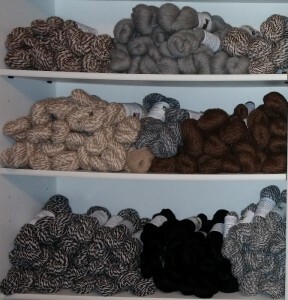 We have a great selection of yarns in white, gray, fawn, and black. 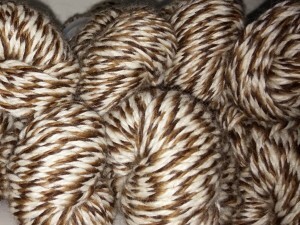 This year we also have a great selection of ‘candy striped’ alpaca yarns in all natural colors. We have black and white, brown and white, gray and white, fawn and white, dark and light brown, as well as multicolor yarns made up of 3 and 4 different colors. Our alpaca yarns are all natural, 100% alpaca yarns. We don’t use any dyes in our alpacas’ yarns, and we include on the label the names and pictures of the alpacas who grew the fiber that goes into each yarn. 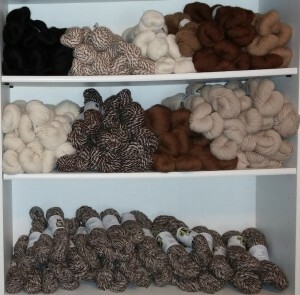 You can see all these beautiful yarns from our alpacas online and in the store. The process from alpaca to yarn is a big part of what we do at the farm, and we love to share it with people. You can learn more about the shearing and sorting processes, as well as take a virtual tour of the fiber mill where we process our yarns and rovings here on our webpage in some of our earlier posts.